Thinking of buying a new car in the coming months? Then you’ve no doubt heard about Hire Purchase (HP) and Personal Contract Plans (PCPs) when researching your car finance options. These motor finance agreements have grown in popularity, with PCPs becoming particularly widespread according to the Financial Conduct Authority (FCA). It estimates that PCPs accounted for around 66% of the value of new and used car lending in 2017. This compares with 34% in 2008. There is further detail in the ‘small print’ of motor finance agreement which consumers should be aware of. With a PCP for example, they will need to be conscious of the mileage they are clocking up. This is because the balloon payment at the end of the agreement will have been calculated with their annual mileage in mind. If on the other hand a consumer takes out a car loan before purchasing a car, they are effectively going as a cash buyer to the car dealer and are in a far better position to negotiate a deal. Bannvale Credit Union operates three offices, their main one in Portglenone, which is open six days a week and a sub-offices in Bellaghy that is now joined by the new one in Ahoghill. Angela Hegarty, Manager of Bannvale Credit Union said: “Bannvale Credit Union Limited is delighted to officially launch the opening of our new office here in Ahoghill. “Access to the services that the credit union provides is vitally important, but with our three offices now operating in the local community, it’s now easier than ever to take advantage of credit union membership.” The Ahoghill Office is open three days a week, providing a savings and loans facility to the local community – as it has done for over 53 years. “With our new premises, we are equipped to provide that, and more, long into the future,” the manager continued. “We are welcoming new members every day, who are looking for a safe place to save their money, and the ability to borrow against those savings if and when they need to, with peace of mind knowing they have access to affordable credit.” Ahoghill Office opening hours are: Tuesday 3:30pm – 6:30pm; Friday 9:30am – 12pm and Saturday 12pm – 2pm. Bannvale Credit Union, 51 Main Street, Portglenone, Co. Antrim BT44 8HP. 1. Prize draw entries are open to residents of Northern Ireland, aged 16 years or over, excluding employees and their families of the Promoter; the members of the board or anyone professionally connected with this promotion. This is applicable at the time of the draw. 2. One entry per week, for the duration of the promotional period, will be accepted upon completion of the entry form available from the Ahoghill branch of Bannvale Credit Union. The promotion starts on Monday 16th January 2017 and runs until Saturday 10th February 2017. The draws will take place on or after the Saturday of each promotional week. Complete the entry form, in person, available from the Ahoghill branch of the Bannvale Credit Union. The prize comprises 4 (four) x £50 (fifty pounds) cash prizes, with one prize of fifty pounds available per week, during the promotional period. The “week” runs Monday to Saturday within the promotional period stated above. One prize draw winner will be chosen at random, each week, on or after the dates stated above. Draws will take place in front of an independent adjudicator. Prize winner will be notified by e-mail or phone within 10 working days of each draw. In the event the claim for a prize is not received by the Promoter within 28 days of such notification or the prize is otherwise declined, the Promoter reserves the right to withdraw prize entitlement and award the prize to a reserve selected at the same time as the original. No responsibility can be taken for entries, which are lost, corrupted, damaged, misdirected or incomplete or cannot be received for any technical, delivery or other reason. For the full name and county of the prize winners please send a S.A.E. to Bannvale Credit Union, 51 Main Street, Portglenone, Co. Antrim BT44 8HP or after 28th February 2017. This information will be available for a period of 3 months. The names of the prize winner may be used in publicity materials. Winners may be required to participate in publicity photography and must be willing to do so with no further recompense. The Promoter reserves the right to terminate or modify these terms and conditions in its absolute discretion at any time due to wholly exceptional circumstance outside its control and only where circumstances make this unavoidable but will use all endeavours to minimise the effect to the customer in order to avoid disappointment. Prize must be taken as stated and there are no alternatives in either cash or kind in whole or in part. Winners are not allowed to transfer the right to take up the prize to anyone else. The Promoter reserves the right to verify all entries and winners and to refuse to award a prize or withdraw prize entitlement where there are reasonable grounds to believe there has been a breach of these terms and conditions or any instructions forming part of this promotions entry requirements or otherwise where a participant has gained unfair advantage in participating in the promotion or won using fraudulent means. 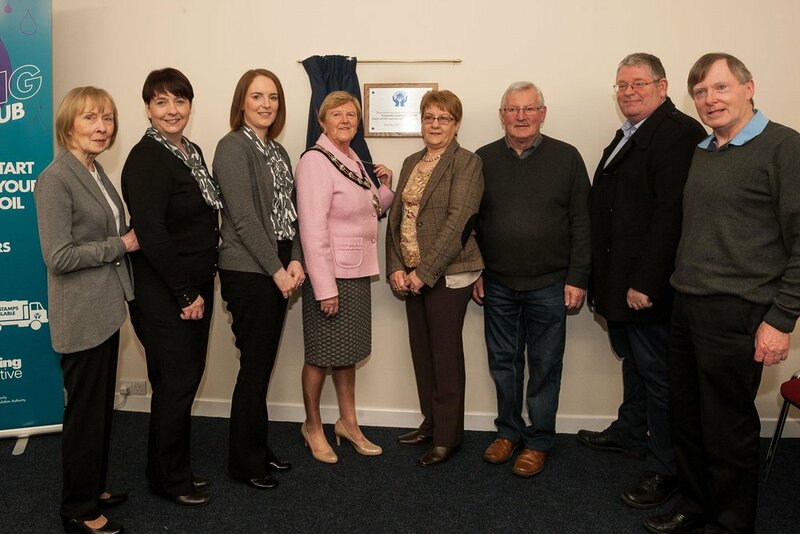 Bannvale Credit Union are delighted to announce the new Branch is now open in Ahoghill!